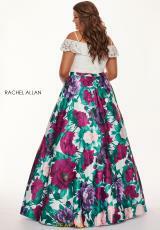 Be bold and rock this vibrant print prom dress 6672 by Rachel Allan Curves to this years senior prom. This gorgeous gown features a white lace bodice with flutter off the shoulder sleeves, plunging V neckline with illusion modesty insert and beaded thin straps. Made in satin floral printed fabric, the long a line skirt has hip pockets. See more amazing Rachel Allan Curves gowns at Peaches Boutique.